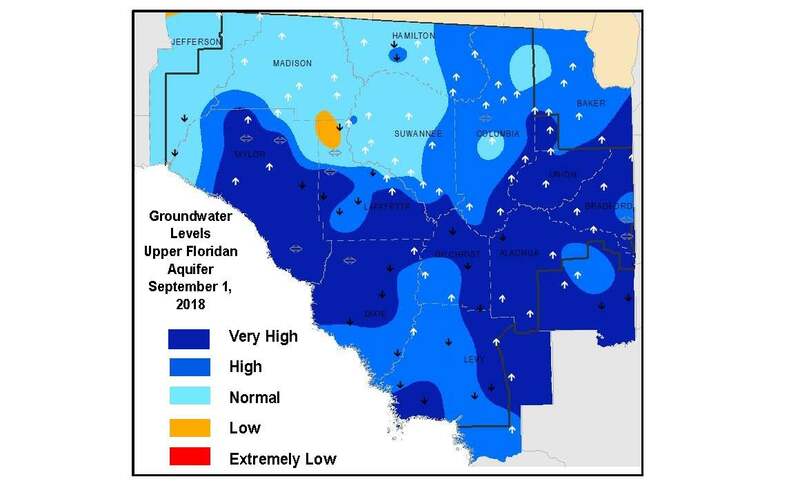 While aquifer levels have receded in many areas of the District, there are areas in Levy, Dixie, and Taylor counties where groundwater levels remain above the 90th percentile. Anticipated rain and storm surge from Tropical Storm Michael have increased the risk of localized flooding in those areas based on the trajectory as of mid-day today (10-8-2018). Other parts of the District will likely experience rainfall and heavy wind gusts – downed trees and power outages are expected. Any shifts of the anticipated storm path eastward increase the likelihood of flooding in inland counties especially low areas that may not be near a river. Currently, all 15 counties within the District are included in Gov. Scott's executive order which allows for emergency resources to be made available. The District is actively monitoring the storm in partnership with the National Weather Service, Tallahassee station and working with local counties to provide information and resources.